In January, 1967, a kid watched the funeral of Marine Cpl. Richard A. Funelli, Jr. in Farrell, PA.
Krokoski did indeed become a career officer, retiring as a Lieutenant Colonel. He never lost his desire to know more about Cpl. Funelli. He finally got some answers many years later after posting a question on the Internet. The information on the virtualwall.org that Cpl. Funelli died of artillery, mortar, or rocket fire would support Bolton’s version. The bottom line is this: it really doesn’t matter. Such variations can be attributed to the intense confusion that always surrounds close combat. This was the second time Cpl. Funelli had been hit with shrapnel. He had been evacuated to Japan in March, 1966, to recuperate from wounds to his legs. He returned to Vietnam in late September. Cpl. Funelli was the son of Mr. and Mrs. Richard A. Funelli, Sr., of Farrell. 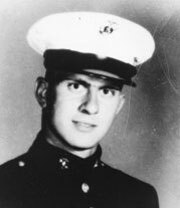 Richard Funelli Sr. served with the Marine Corps in World War II on Iwo Jima and Okinawa. Cpl. Funelli enlisted in the Marine Corps two months after graduating from Farrell High School. He left behind his parents and a brother, Gerald, who was a ninth grader at Kennedy Christian High School at the time of Richard’s death.